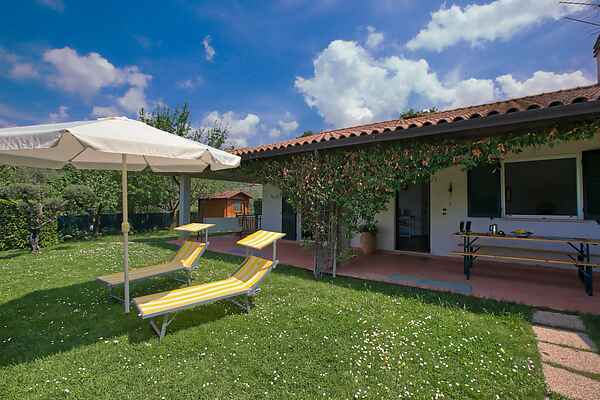 Get to know all about this luxury holiday house sited only 800 metres from Lake Trasimeno! This semi-detached house is spacious and nicely furnished. Enjoy the luxurious bathroom with its massage shower! Open the door to your own roofed patio and take in the wonderful surroundings. The enclosed garden contains a barbecue, ideal for a culinary evening! And the outside whower can be beneficial during the warmest days. Of course you've included a day-cruise in your holiday schedule! You can purchase a day ticket to explore Lake Trasimeno and its islands by boat. There is a boat connection (10 minutes) from San Feliciano (2 km) to the atmospheric island of Polvese. You can take a pleasant stroll there (about 3 km) along this island's historical sites: the San Secondo Cloister, Church of San Giuliano and a 14th century castle. Culture is just around just the corner: Castello dello Zocco. Built in 1400, it forms part of the defence line of Trasimeno's eastern region. Also go and explore the medieval town of Cortona (20 km), built against a hill. The cultural student town of Perugia is about 30 km away. Casa di Zocco is situated just outside San Feliciano, a quiet village by the side of Trasimeno Lake surrounded by hills, rich in olives. Close to the house there are swimming pools, beach volley fields, beaches and typical restaurants we can suggest you. In the town there is a little port of shipment for Polvese and Maggiore Islands to make a really nice excursion. Starting from San Feliciano you can easily visit Perugia (25 km), Cortona (30 km), Crete Senesi (45 km), Assisi (45 km) and other cultural and naturalistic places in Umbria and Tuscany. The freeway is only 4 km from the house. The airport of Perugia is 34 km from San Feliciano.